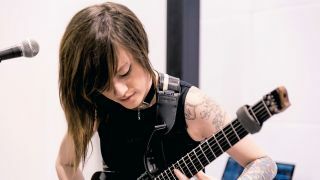 Sarah Longfield is one of the country’s premier exponents of state-of-the-art shred. Armed with an eight-string Strandberg Boden axe and some killer technical skills, the guitarist takes a pianistic, multitonal approach to two-handed tapping. And — although she draws from key influences Meshuggah and Animals As Leaders — her style and sound are decidedly unique, not to mention instantly recognizable. Top that off with the songwriting, production and arranging chops she displays on her latest album, Disparity [Season of Mist], and you’re looking at a truly heavyweight talent. Which is why it’s so surprising that Longfield comes from a completely non-musical family. Although she started off playing violin, piano and flute as a kid, things changed forever when she visited a local music store at age 12. “I looked at a guitar and thought, well, it has strings; it’s kinda like a huge violin. I picked one up to try and just fell in love with it.” She spent a mere four months on six strings before making the leap to seven. “I saw it in the same way you get a 66-key or an 88-key piano — the scope was broader, and it seemed to fit with what I was trying to achieve.” When she spotted an eight-string axe in her local guitar store, she immediately became a fan. Besides her ubiquitous custom-painted Strandberg Boden 8, she also plays a Strandberg Metal 8 and a Metal 6. Oh, and, surely Longfield practices all the time, yes? “No!” she says. “Sometimes I won’t play the guitar for months at a time when I’m not touring.” Cue the sound of woodshedders across the planet throwing down their guitars in despair.